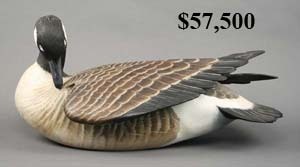 Anyone who was wondering if the decoy auction market would continue strong this year has their answer, YES! 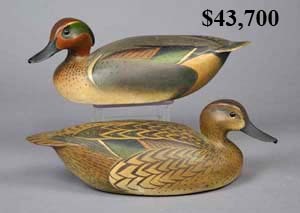 Guyette & Schmidt, Inc. conducted their 23rd annual spring decoy auction on April 24 & 25 at the Pheasant Run Resort in St. Charles, Illinois. 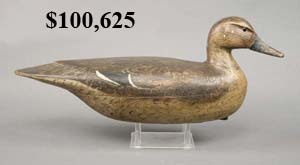 The auction was held in conjunction with the National Antique Decoy & Sporting Collectibles Show and grossed $3,579,797 which made it the 5th highest grossing decoy auction of all time. 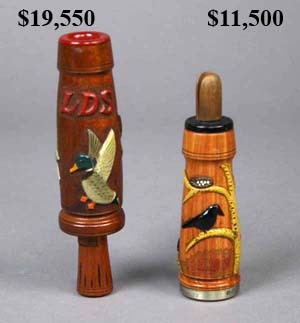 The crowd was large and the prices were high. 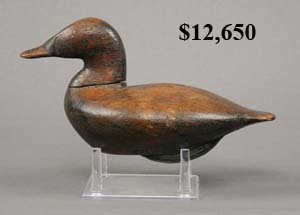 Prices were particularly high for Midwestern and Louisiana decoys as well as decorative carvings by the Ward Brothers (Crisfield, Maryland). 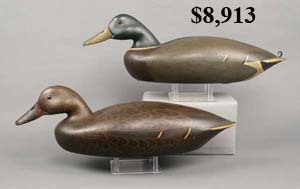 Three decoys sold for over $100,000; 9 lots sold for over $50,000; 34 lots sold for over $25,000 and 76 lots sold for over $10,000. 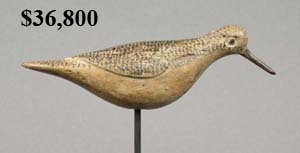 An interesting aspect of this auction was that it contained many quality decoys that had sold at auction previously and therefore presented a great look at how the decoy auction market is evolving. 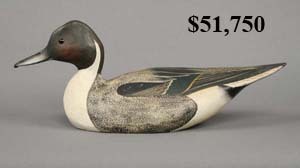 Once again a great decoy, a sleeping mallard by Enoch Reindahl, which sold at the Jim McCleery auction in 2000 for $46,000 brought a good return selling this time around for $92,000 an auction record for the maker. 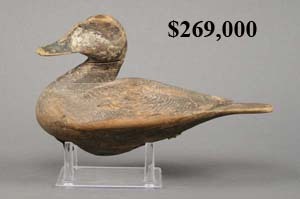 Other examples were a Lee Dudley ruddy duck which sold in 1991 for $52,800 sold this time for $269,000, a new auction record for a North Carolina decoy. 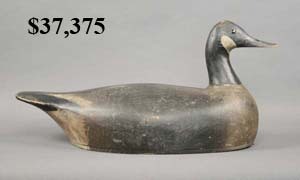 The best known mallard drake by Charles Perdew sold at auction in July 1991 for $21,000, this time it sold for $137,000. 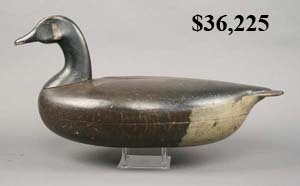 A swimming Canada goose by Ira Hudson that sold at auction in 1985 for $19,800 sold this time around for $71,875. 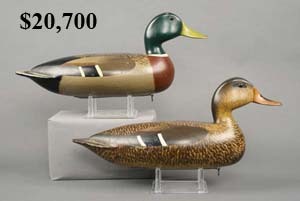 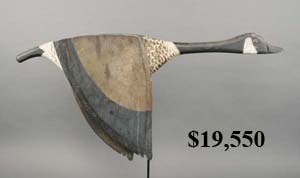 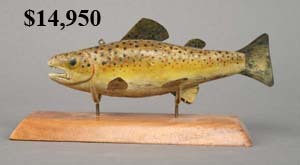 World record auction prices were established for many decoy makers including: Phinneas Reeves, Lee Dudley, Dave Watson, Enoch Reindahl, Cassius Smith, Hiram Hotze, Mitchell LaFrance, Nicole Vadacovich, Gaston Isadore, Adam Brown, Antonaise St. Germain, Ben Dye, Mark Whipple, Art Herron, Ray Thompson, "Heck" Whittington, Gaston Isadore and others. 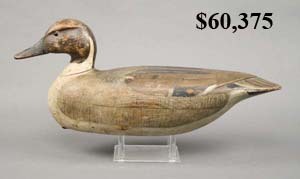 Guyette & Schmidt, Inc. attributes the high prices to the excitement generated by auctioning decoys from famous old time collections and new buyers participating at Guyette & Schmidt, Inc. because of their cross marketing program with Christie's.